Sent back to Morocco in August, 20 migrants were sentenced to prison sentences in Tetouan for illegally entering Ceuta. For NGOs, the verdicts were unexpected but unjust. 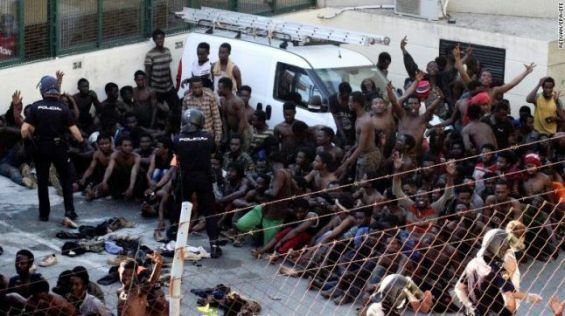 Dozens of migrants, expelled by Ceuta in August, were sentenced in Morocco to prison terms for illegally and violently entering the Spanish enclave. 17 of them were handed over two-month long sentences and fined 500 dirhams after being tried by the court of first instance in Tetouan. The decision was «unfair», according to the president of the Moroccan Association for the Integration of Immigrants (AMII) lawyer Ahmed Kalifa. However, the sentences «were low» as these migrants were prosecuted for charges that can lead to sentences that can reach three years in prison, reported Publico. The Manos Solidarias Association, based in Tetouan, and the Moroccan Association for the Integration of Immigrants, who have mandated lawyers to assist the migrants, say they are relieved. This is the second time that a group of migrants, who have tried to enter the enclave, have lawyers to defend them in a Moroccan court, stressed Ahmed Kalifa. «We did it last year. We made the trial a little fairer and the migrants had the opportunity to have someone to defend their rights». In fact, having these kind of verdicts pronounced by a court is uncommon in Morocco, he added, because, when massive expulsion operations occur, the number of migrants tend to be high that they are allowed to return to Morocco. For lawyers, Spain is partly responsible for the current situation. They explain that the verdict was pronounced after Spain decided to expel these migrants, bringing back an agreement signed in 1992. According to Ahmed Khalifa the above-mentioned agreement doesn’t refer to the prosecution of migrants returned back to Morocco. The Iberian country would not have fulfilled its part of the contract because «the correct identification of 116 migrants in one night is impossible», argued Ahmed.